Updated Dec. 28, 2015 6:02 p.m. The hotel industry is booming, as high occupancy and room rates make properties more valuable to own, driving hotel prices higher. The boom is manifesting in new construction, major renovations of existing properties and a record rate of hotel sales. 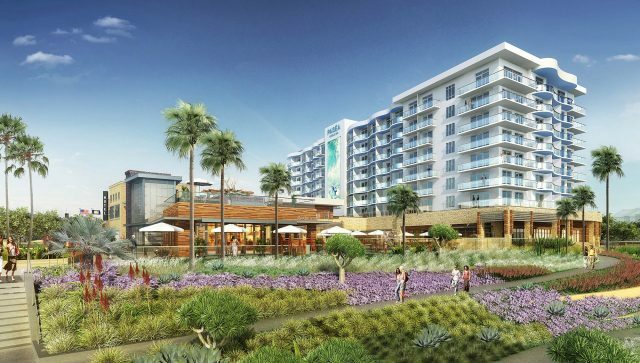 A handful of hotels are being built in Orange County, including the Paséa in Huntington Beach. And a number of existing ones, such as the Island Hotel in Newport Beach, have undergone major renovations this year. Many other hotels changed hands as developers looked to increase their stake in Orange County’s lucrative hospitality market. In 2015, around $1.4 billion was spent on hotel purchases in Orange County, according to Atlas Hospitality Group, an Irvine-based real estate company that specializes in hotels. The firm also said that about eight hotels are under construction here, and four have opened in the past year. The industry is widely expected to continue growing in 2016, but at a slower pace. Across the street from the iconic Huntington Beach Pier sits the construction site of the Paséa Hotel & Spa, a much anticipated high-end hotel that will open next year. Once completed, the resort will have 250 rooms and a Bali-inspired Aarna Spa. Construction is expected to wrap up in April and the hotel expects to take guests starting May 1, before hosting a grand opening in June. The Paséa is already taking reservations for July 1 and will continue to move the date up to accommodate earlier guests if construction remains on schedule. The hotel prides itself on offering its guests a different experience. Blakeslee joined the project this summer. The overall hotel design was already in place, but he has focused on creating a culture of service and the best possible guest experience. He has helped immerse the hotel in Surf City culture by giving guests flip-flops instead of slippers and offering services such as surf butlers to wax boards and hold on to them while guests are busy. “We took something raw and fun and tied it into this luxury environment,” Blakeslee said. The hotel will offer 34,000 square feet of event space, as well as dining options. Tanner’s, a signature restaurant, will serve fire-inspired coastal food. Tanner’s Treehouse, an outdoor bar, will also be on the property. The hotel rooms will cost 10 percent more than rooms at the Hyatt Regency, where on Saturday a Resort View King room cost $250. Room rates around the county have been increasing as hotel occupancy rates soar. In 2014, hotels in Huntington Beach – which has 3.5 million visitors a year from outside Orange County – were at 83 percent occupancy, and rooms went for an average of $249 a night, according to Visit Huntington Beach, the city’s tourism bureau. That was up from an occupancy rate of 77 percent and an average room rate of $230 a night in 2013. Occupancy rates in the county as a whole have been high this year, at around 80 percent, according to Alan Reay, president of Atlas. “Very healthy occupancy is north of 70 percent; 80 percent means we will see higher hotel rates next year,” Reay said. Occupancy rates are unlikely to increase further, since 80 percent occupancy generally means hotels are at full capacity during high-demand times, said Lukas Hartwich, a senior analyst at Green Street Advisors, a Newport Beach-based real estate research firm. Right now, the average price of a hotel room in the Disneyland area is $167 a night; near the beaches it is $209 a night; and in the Santa Ana/Costa Mesa area the price is $126, Reay said. The Paséa is not the only new hotel expected to open next year. Most hotels being developed now are high-end and limited service, Reay added. They are less expensive and require less land than luxury resorts. Around $200 million was invested this year in new buildings and renovations in the Anaheim Resort District near Disneyland, and three new hotels opened there this year, according to Visit Anaheim, the city’s visitor bureau. In addition to Anaheim, new hotels are springing up at the Irvine Spectrum, in Newport Beach, and near John Wayne Airport. And Great Wolf Lodge is building one of Orange County’s most highly anticipated hospitality projects – a new hotel and water park in Garden Grove. In addition to new builds, other hotels are undergoing major construction. Reay added that older hotels have to renovate now in order to be competitive with the new hotels that are popping up. The Anaheim Majestic Garden Hotel, which became independent of the Sheraton in May, is undergoing a $6 million renovation. The 489-room hotel has already redone the pool area, and it has remodeled some of the rooms to include fun features like fantasy bunk beds. The work will be completed in February. Reservations for December at Anaheim Majestic are outpacing last year, according to Cindy Smith, director of sales and marketing. The hotel expects its occupancy this year to be 10 percent higher than in 2014. In November, the iconic St. Regis Monarch Beach started the final phase of a $30 million renovation, expected to be completed in spring 2016. The project includes changes to the lobby, pool area and spa, and the addition of five new restaurants. Moreover, 400 rooms have already been redone. In the spring, the Irvine Co. finished an 18-month renovation of the Island Hotel in Newport Beach. The project included newer technology, more personalized touches and an upscale coastal design. Since those changes were made, the property has seen occupancy rates of more than 80 percent, said Ralph Grippo, president of Irvine Co.’s resort division. This year started off with a bang in hotel acquisitions. In January, the 250-room Montage Laguna Beach was bought for $360 million in the biggest hotel sale in California history. Then in September, the Montage and the 393-room Ritz-Carlton, Laguna Niguel got a new owner when the Blackstone Group, which owns the Motel 6 budget hotel chain, bought its parent company, Strategic Hotels & Resorts Inc., for roughly $6 billion. • The 656-room Hyatt Regency in Garden Grove, which was sold by Xenia Hotels & Resorts to the U.S. arm of Shanghai Construction Group for $137 million. • The 485-room Marriott in Irvine, which was sold for $126.2 million – the third hotel in Orange County to fetch more than $100 million. • The 157-room Shorebreak, located at the Strand in Huntington Beach, which was acquired by DiamondRock and is being operated by Kimpton Hotels & Restaurants. • The 131-room Carousel Inn & Suites, directly across from Disneyland, for which Disney paid $32 million. In total, 23 hotels have been traded in Orange County this year and five are in escrow, according to Reay. But the current boom is not expected to continue. Hartwich added that even though this year started off strong, it has begun to drop off, especially in terms of revenue per available room. He added that 2016 would still see some growth in the hotel sector, but it would likely be much slower. The strength of the U.S. dollar is affecting inbound tourism and making it cheaper for U.S. travelers to go abroad, which could diminish the tourist traffic Orange County sees in future months, Reay added. And a $1 minimum wage increase in California to $10 an hour will likely have a chilling effect on lower level hotels, which have a harder time paying workers more.